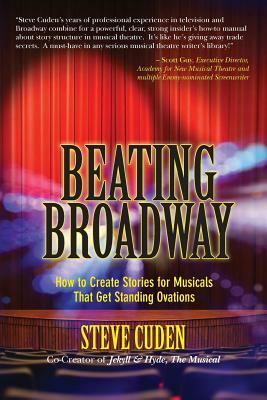 Beating Broadway: How to Create Stories for Musicals That Get Standing Ovations (Paperback) | The Drama Book Shop, Inc.
Cuden, who has been there, done that, offers writers the know-how and encouragement to construct brilliant, attention-grabbing musical storylines. Beating Broadway provides readers with practical, down-to-earth advice for crafting successful musical theater stories that will reach audiences everywhere. This complete, two-part manual also guides aspiring writers in what it takes to develop shows that can attract Broadway producers. By showing writers the ins and outs of storytelling required for today's commercial musical theater, Beating Broadway places success firmly within grasp. Readers also gain insight into how stories function in forty of the world's most beloved stage and movie musicals as Cuden breaks down each one into key narrative beats and plot points. Steve Cuden co-created the Broadway and international hit musical, Jekyll & Hyde. Cuden co-wrote the show's original book and lyrics with noted composer Frank Wildhorn and also contributed lyrics for numerous songs in the long-running Broadway show. He teamed with Wildhorn again to co-conceive the international hit musical Rudolf, Affaire Mayerling, which has been produced on stages in Hungary, Vienna, Japan, and Korea. He also directed and co-produced the cult favorite, award-winning horror-comedy feature, Lucky. Having written nearly ninety teleplays for popular animated TV shows, Cuden's work has been featured in such notable shows as X-Men, The Batman, Goof Troop, Pink Panther, Xiaolin Showdown, and Iron Man. He teaches screenwriting at Point Park University in Pittsburgh, Pennsylvania.